Teaching the Shorter Catechism has never been easier. This book of daily readings … aids memorization by devoting six days per question, explains the catechism in simple language, provides six different meditations on the main points of each question. It also includes key Scripture readings and takes just a few minutes each day, allowing time for discussion and review. It is useful in the home, church, or classroom. I have been searching for a resource to assist in teaching my children (and studying myself) the Shorter Chatechism. Our family has been using this resource for the first week and so far I am very impressed. It is in language that is accessible for my 7-year old, and yet has meaning that is deep enough to keep my wife and me both interested. After the first week when we took Sunday off, my younger daughter expressed disappointment that we didn't read from it. THAT is a blessing! Starr Meade has written a superb tool that is truly effective. Using questions from the Westminster Shorter Catechism she provides six-days' worth of brief comment and scriptural cross references for each question. By the end of the week the children have thoroughly learned the question and answer and understand from scripture other related principles. I looked awhile before I found this type of tool. 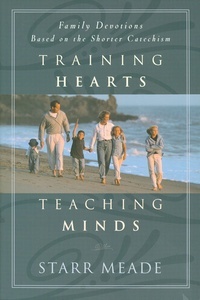 I recommend it to anyone who is looking for an effective way of teaching doctrine to their youngsters.